It stands to reason that after teaching for so many years I would have the pleasure of seeing students grow up into amazing young adults who would approach the world with a ferociousness I could only be proud of. I find myself feeling a bit of maternal pride as I see their accomplishments updated on their Facebook feeds — the graduation announcements, wedding announcements, baby pictures, the sighs of relief after bar exams are completed (and passed). I send them house warming gifts when they excitedly move into their first homes and grieve with them when they’ve lost loved ones. We experience a strange threshold crossing together when we pass through the doorway from teacher and student to peer and then to friend. I’ve written letters of recommendation and I’ve proofread scholarship essays. Sometimes I am asked for advice on girls or boys who then become spouses. And every once in a while I am asked to become a part of something extraordinary. I not only taught Erin but I also taught her sister Makinsie, two girls who could force the earth to revolve around the moon if they were so determined. They are blessed with parents who have taught them that they can accomplish anything if they worked hard enough and, more than that, will support their daughters to be successful. I have loved teaching these young women. In fact, I wrote about Makinsie not too long ago when she began fundraising for Smile Train — the nonprofit she chose to raise money for her second Ironman competition. That’s right, her second Ironman. I want to be the youngest female aviator to circumnavigate the globe. I want to break the record. Can you help me? How could I turn Erin down when I have absolutely no knowledge of aviation, promotion, proposals, or how to raise a substantial amount of money? However, I do know that women represent only 6% of pilot population and that is not okay. Erin wants to part of a new generation of female aviators, inspiring other girls and young women to get into the captain’s seat — where they belong. If I can help her accomplish this goal then I will learn everything I can to make it happen. One Flight. One Globe. One Vision. 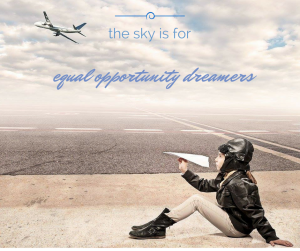 The sky is for equal opportunity dreamers and Erin has set her sights on taking off on an historic flight that will take her around the globe in approximately 10-14 days. She plans to share flight experiences via podcasts, webcasts, and a blog so that elementary schools can see what she is seeing and experience what she is experiencing. Through today’s technology Erin hopes to inspire tomorrow’s aviators. I hope she knows she has already inspired yesterday’s teachers. I hope all of you will follow Erin Davis, Aviator in her quest to become the youngest female aviator by following her on Twitter, Instagram and her Facebook page.